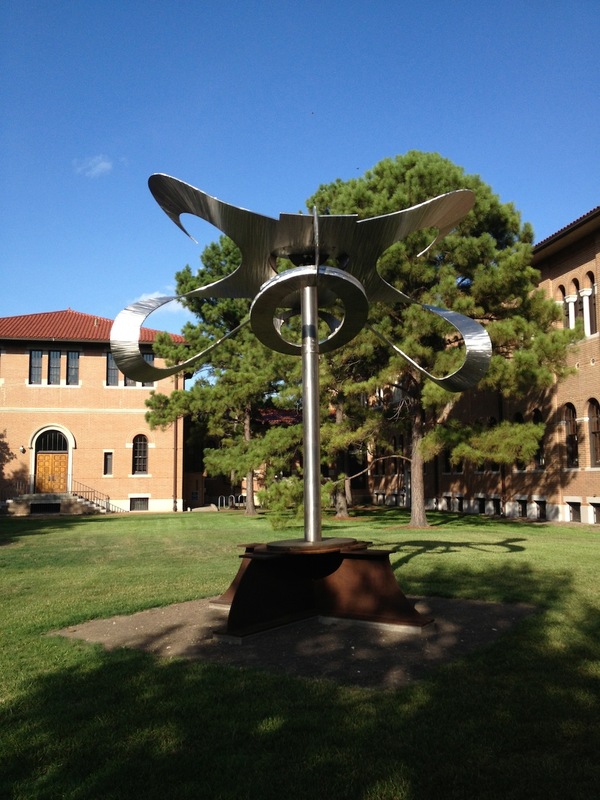 This is the new Mark di Suvero at Rice University. Mark di Suvero, Po-Um (Lyric), 2003, Steel, stainless steel 16' x 16' 3" x 8' 5"
It was apparently in a private collection when it was displayed in 2011 on Governor's Island. How Rice got it, I don't know. It seemed atypically curvy when I saw it. I'm used to the more severe di Suveros, like the one in Menil Park. But a look at di Suvero's website shows that "curvy" has been his thing for more than 10 years now. It's on a pole and is designed to rotate, but I assume it takes a pretty stiff breeze to get this behemoth to move. I was over on campus yesterday. I can't say I love this. 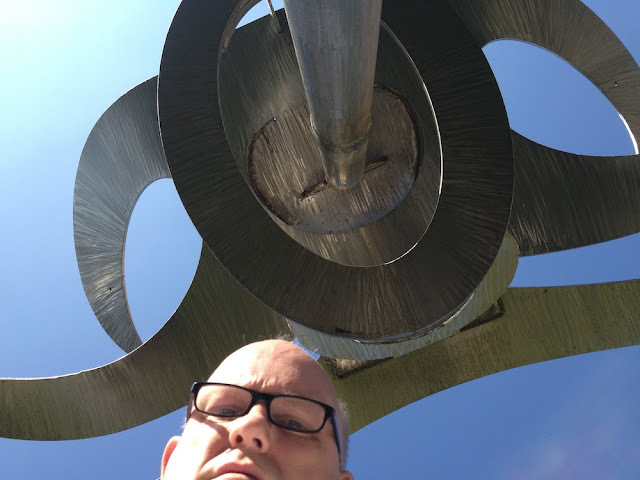 It's no 45°, 90°, 180°, which fits my idea of a great public sculpture to a tee. 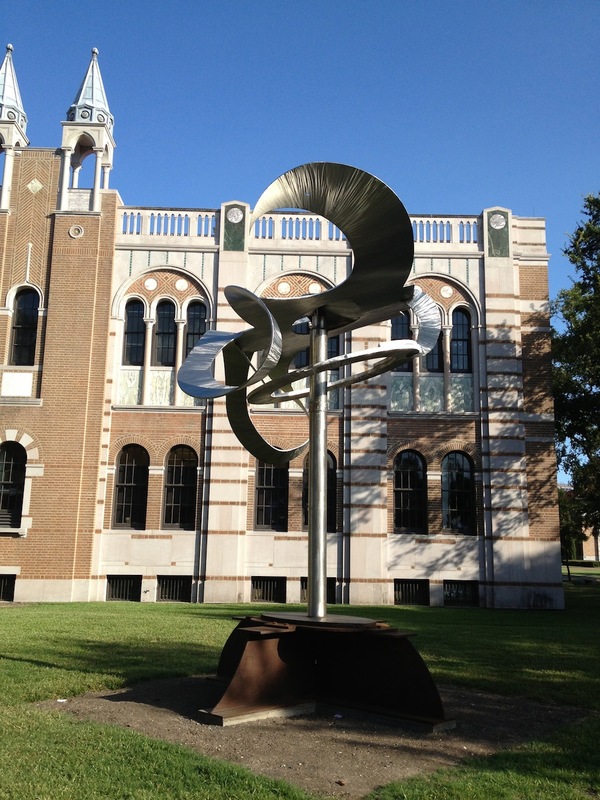 In addition to being an interesting piece of art, it's one that its audience (students, mostly) interact with directly. They sunbathe on it, they climb it, classes are conducted on it, people study on it, etc. 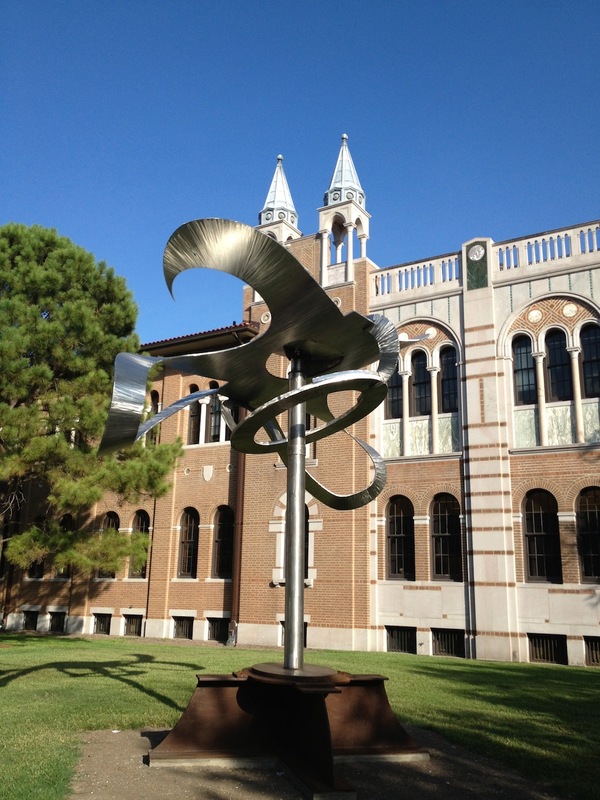 But Rice students are resourceful--they may find unforeseen ways to interact with Po-Um (Lyric). I wonder how that sculpture can handle a Cat. 4 hurricane? I wouldn't want to be any where near it, what with those sharp, pointy bits. Just get a stick and set it spinning. I can see an awesome game of "spin the bottle". It could be pointed at an opponent's campus during football games. Use it as a random spinning wheel for an improvised game.